As we inch closer toward season two, it’s time to look back on the previous 365 days. It was a long year, and certainly an eventful one for the NBA 2K League. There was qualification, a combine, an inaugural draft, the first season of the league itself and then an expansion draft and a second combine, and that’s just the start. And within that season was a collection of weekends, games and moments that defined it. From mainstream media exposure to legendary individual performances and epic matchups between longtime Pro-Am rivals, season one had it all and then some. We’re here to discuss the 10 moments that we’ll remember for as long as the league exists (this was initially just five moments, but way too much happened to try and narrow it down). Will Beverina: As soon as the Tipoff schedule was released, everyone circled the Dimez-oFab matchup in Group D. The first game between the number one and number two picks in the draft would be given to the masses almost immediately. It didn’t disappoint. Early on, CLTX Gaming dominated, and by the middle of the second quarter they had amassed a 20-point lead. As you can imagine, the Twitch chat was very composed and did not overreact to two quarters of play to get off their Dimez takes. Somehow, though, the Mavs fought back and had the game tied by the end of the third quarter and eventually won, 81-74. This still remains the biggest comeback win in league history and is probably one of the best games ever in league history. Josiah Cohen: I think this was probably the best possible outcome for the league. Dimez vs. Fab, the consensus top two point guards coming into the league. The so-called “group of death.” And the Mavs pulled it out, in the end, with Dimez posting one of his best statlines of the year in a game that turned out to be really good. Three guys with 20+ points turns out to have been the pinnacle of what the Mavs could hope for. But this game set the tempo and the narrative for the early part of the season, at least where preseason hype was concerned. Will: This was a big moment for the league, and one of its first real exposures to the mainstream sports media, Scott Van Pelt’s lack of enthusiasm be damned. While Kings Guard was profiled in a SportsCenter piece, a primetime highlight reel on ESPN is a landmark moment for any league. This was something the NBA 2K League needed. Will: Before the Shot-creating Slasher madness, IdrisDaGoat6 pulled off–almost out of nowhere–the first-ever triple-double in the league’s history against Cavs Legion in the first round of The Turn. While others would follow with their own triple-double efforts, I’ll pencil this down as the most impressive of the bunch as it was pulled off from the power forward position. Josiah: I never underrated Idris for a second. When I went to visit with and write a story on the Knicks before the season started, at their facility across from MSG, Idris posted a 20/20 double-double in the preseason scrimmage. Idris sort of epitomizes what the Knicks were throughout the year. A really talented team that struggled to adjust to new roles and playing as a team, but when push came to shove really got their act together and capitalized on their wealth of talent. Will: We honestly could have put all of week 10 here, but this one game of course stood out above the rest. Eighty-four points is an entirely crazy number of points to score in a single game and a record that wasn’t even close to being touched in season one, and many would say a record that will stand for as long as the league is alive. No matter your thoughts on the Shot-creating Slasher, the 5-Out, whatever, 40-for-55 is insane, and the 3OT thriller between 76ers Gaming and Grizz Gaming is one of the best games of the league’s young history. Josiah: Don’t tell me that you could have stopped AA or that iFeast turned in a terrible defensive performance. I want to say that this was a victory for us anti-five-out people, but AA is just such a great player and so clearly about more than scoring that it was tough to see his Herculean effort fall short. This is a record that’s here for a long time. Will: This remains as perhaps the biggest upset of season one. Blazer5 Gaming was an absolute juggernaut at this point and was the defending tournament champion after taking home The Turn. When Kings Guard came out with a lineup that put Worthingcolt at point guard and Mootyy at center, it seemed as if the team was just doing some experimenting in a low-leverage situation. That proved not to be the case, and the Kings took down first-seeded Blazer5. I was in the studio when this happened, and the energy after the game matched even the atmosphere of the Finals in August. Josiah: I still can’t believe this happened. Will: You can’t leave out the tournament that was the catalyst for the Knicks’ run to the championship. In hindsight, this run was even more impressive than it originally seemed when you realize that the Knicks beat three playoff teams–Raptors Uprising, Wizards DG and Cavs Legion–on their way to the finals before beating The Turn runner-ups CLTX Gaming to punch their ticket to the playoffs. Josiah: I remember being really excited for the Raptors when I wrote the pre-Ticket TSN column, thinking that hey, maybe this is their tournament to win. Then the Knicks knocked them out right away. I got some vindication when the Raptors completed their run to the playoffs, but the Knicks truly shocked the world in this tournament. This was the pivotal moment of the season. Will: If we were organizing these by infamy, this would probably be number one on the list. Blocked. By. The. Backboard. First-seeded Blazer5 would go down in the first round–sound familiar?–when it mattered most, because NBA 2K18 was, let’s say, not a perfect game. This of course allowed the Knicks to pick up where they left off from The Ticket and eventually take home the championship. Josiah: I think this is the intro for the Blazer5 petition to change the playoff structure for season two. There’s nothing crueler than an animation like this and nothing that makes the game feel so out of control. Out of control and out of the playoffs, I suppose. Will: This is by far the most underrated moment on this list, for some reason. Last minute, do-or-die in the finals, protecting a one-point lead. Drive the baseline, go up with it, easy slam dunk. Except it wasn’t. The look on Jalen’s face as he realized his dunk didn’t go is iconic on its own. Piling onto the misery was a fast break on the other end leading to a 3-pointer. Jalen converting that dunk is easily one of the biggest what-ifs of season one. Will: While a highlight reel on primetime ESPN is big, a one-on-one interview on primetime ESPN is bigger. 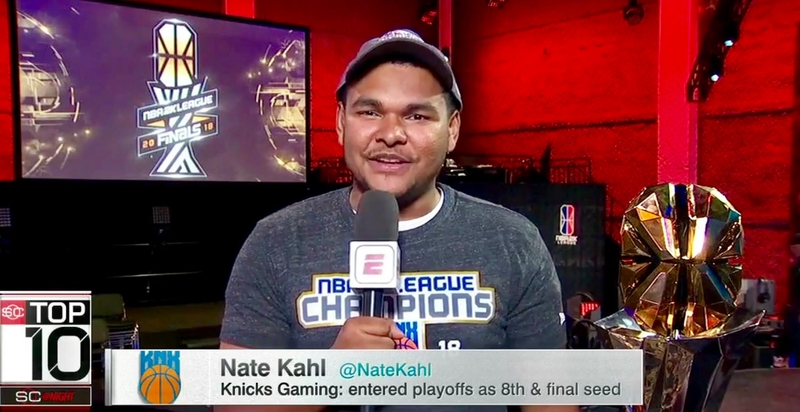 After a Herculean effort on defense in the finals, NateKahl won Finals MVP and earned himself the chance to appear on television. Even better, he held his own and proved to be a fine ambassador for the league to a mainstream audience. A perfect cap to a wild season one for the NBA 2K League. Josiah: I’ll say it once again: Nate could lead media training for every player in the league. The Finals wound up being an amazing culmination of the league’s season, a struggle at times but in the end incredibly worthwhile. The poetic symmetry of ESPN to ESPN appearances for the league is too good not to point out.